The bible describes how the baby Jesus received gifts of gold, frankincense and myrrh to soon after his birth. Today, it seems almost unbelievable that frankincense and myrrh resins were considered as precious and costly as gold - but they certainly were at the time. The ability of frankincense to calm a troubled mind is virtually unsurpassed, which is the reason why the resin has been used for thousands of years in meditation and prayer. For thousands of years throughout the Middle East myrrh was used as an ingredient in incenses, cosmetics, perfumes and medicines. Together with frankincense, elemi, opopanax and benzoin, myrrh is one of the oldest medicines derived from a resin, and has been traded as a commodity for over 3,000 years. When combined together, Frankincense and Myrrh have the ability to inspire and uplift emotions and assist feelings of general well being. 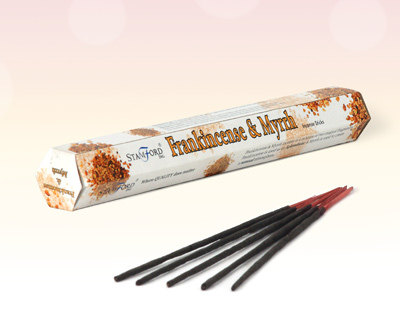 Allow the pleasing aroma of Frankincense and Myrrh in these exceptional incense sticks instill true calmness into your meditation or relaxation sessions.